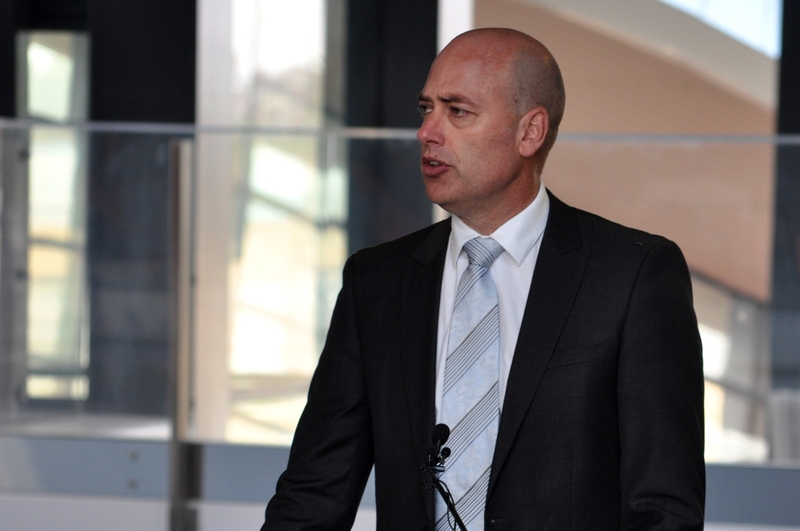 Transport Minister Dean Nalder at the Butler opening. Transport Minister Dean Nalder said the Public Transport Authority aimed to keep noise and vibration within the guidelines set by the Environmental Protection Authority. ‘Before construction of the Butler extension project even began, the PTA undertook comprehensive noise and vibration modelling to determine potential impacts on properties surrounding the future rail line,’ Mr Nalder said. Mr Nalder said modelling recommended the location and extent of ballast matting required to reduce vibration based on ground conditions, geography and track geometry. He said there was 850m of matting installed, and rubber pads used between the rail and concrete sleepers to reduce noise and vibration. ‘While these measures reduce vibration, they will never completely remove it,’ he said. ‘The PTA committed to undertaking noise and vibration monitoring within three months of full time-table services commencing. Mr Nalder said noise monitoring would record day and night levels, while vibration monitoring would take place during the morning and afternoon peak periods. ‘Monitoring will be conducted again between 12 and 15 months after normal train services start,’ he said. Having presented a 178-signature petition to State Parliament last week, Butler MLA John Quigley raised a grievance about the vibrations on Thursday. Mr Quigley said the community celebrated the train line to Butler, but residents living along the line had been suffering from vibrations since trains started trialling the tracks. ‘In those areas where the matting has been laid, there are no complaints from the residents at all,’ he said. ‘However, closer to Butler station, as the cutting allows for the last bridge, there is gross vibration in nearby houses. ‘The vibrations are hitting the bedrock and being reflected back up into this row of houses. ‘There is no problem outside of the home but inside because the home acts like a bass drum, amplifying the vibration. The first train was full when passenger services started at Butler station on Sunday, September 21.